I spent my early formative years in the Blue Ridge Mountains of Virginia and have traveled back to see them throughout my life. I am drawn to the great beauty of the Appalachians and the rich scenery that waits there for the casual visitor and dedicated hiker alike. 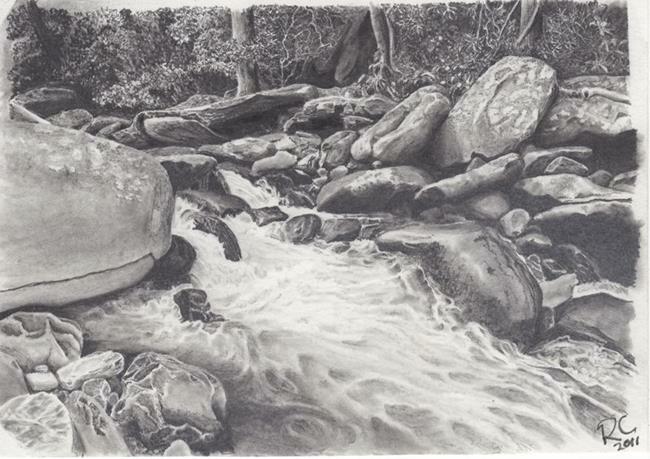 This is drawn from a photo I took in a revine off one of the major routes through the Great Smokey Mountains National Park. It was a couple of hundred feet off the road and about that far down the hillside too. Going down was easier then going back up. The large bolder on the left reminded me of a whale but I doubt it has an official name.